Khogali is Sudanese Muslim. Then, the next hit I find on Google is Patrisse Cullors (a woman), who is an LA-based activist and co-founder of Black Lives Matter (BLM). She has a female husband, Janaya Khan, who is a co-founder of the Toronto chapter of the growing, international movement. Janaya Khan is also another Muslim - a ‘lesbian’ Muslim, to be exact. This busts the myth that Islam is completely anti-homsexual, especially if it plays as good cover for nefarious goals to polarize the U.S. with race baiting. The rise in cases of lesbianism in even Saudi Arabia have been featured in various magazines across the world, while Islamic Muruna, sanctioned by the Muslim Brotherhood, allows all prohibitions, as this system was established by the Muslim Brotherhood when Sheikh Yusuf Al-Qaradawi visited the U.S. back in 1989 and announced the 30 years plan (1990-2020) to cause global revolution. This plan would permit Muslims to even turn lesbian, so long as it's for the cause. As with Ali, boxing led me along a path that allowed me to contribute to the tradition of black resistance. Our generation is fighting many of the same issues that affected Ali and his generation – police brutality, white supremacy, poverty, imperialism and Islamophobia. We are also grappling with many of the same questions around the best strategies for black liberation, from the role of assimilation with the reality of anti-black racism as a hegemonic pillar, to the role of economy and participation in electoral politics … The lessons I gleaned from boxing, my coach, and fighters such as Ali, inform how I theorise and organise … I now do international work for Black Lives Matter, and my connections to many different movement contexts have allowed me to witness the extent to which the loss of Muhammad Ali has affected millennials and elders alike globally. Stories have been shared that dig deeper into his legacy, from being exploited by promoters and hanger-ons to resisting the mainstream media’s efforts to downplay his black and Muslim identities. It is all repeated history when the Nation of Islam original founder, Wali Dodd Farad (aka Wallace D. Fard) infiltrated the U.S. Farad wanted to portray himself as a Sufi saint, proclaiming he was Allah (God) to African Americans. He was not black, but was an immigrant Sufi Muslim from Shinkay, a district of Zabul Province in Afghanistan. From here, we have Black Islam and, today, Islam is the third largest religion in the U.S.
Khan does not even say she is Muslim, yet her arguments from her Facebook on “what took place in Orlando is not Islam” should be revealing. Indeed, we live in an era of confusion by the authors of confusion. Today. pseudoscience is rampant, while we cry out "Peace at last!" We have BLM using genetics to argue over skin pigment superiority, while we have white populists arguing for the r/K theory. The era of bizarre argumentations is rampant. And it is not about pigment. It is about insisting we all convert from Christianity to become spiritual mutants. Claiming that whites can magically make socialism work if we just kick out everyone with melanin in their skin, that whites can defy the laws of economics is like claiming that some men can pass for women and women for men. The latter, which Khan is doing, is becoming legal. So how long will it take for the former too to become the norm? It is all an effort to polarize America, creating an old divide just like that Afghan (Fard) who infiltrated African Americans to create the Nation of Islam. These want to re-open old wounds that were healed decades ago. They want to re-promote old fallacies that have been debunked and buried - fallacies that took a world war to end. All sorts of quasi-religious, obscure history, obsession with pseudoscience, conspiracy theories, the regulation of Black women and their bodies, and the ’emasculation’ of Black men, who were the most resistant to homosexuality - anything to create a nonexistent Afrocentrist philosophy on one side, while the other side wants to create an ethnocentric white supremacy. Whether the U.S., Canada, or Europe, we have become nations of fools. They are not aware of how evil wants to weaken what was once Christendom. So why insist on kicking out immigrants, why not imprison all the mutants, instead? There are many immigrants who are better than homegrown mutants. It will take a World War III to learn this difficult lesson: that without Christianity, the West is screwed. “That revolution” is apparently a reference to the “Arab Spring” revolutions, which were inspired by the Muslim Brotherhood. This is why Black Lives Matter in its international effort was modeled towards the Arab Spring. 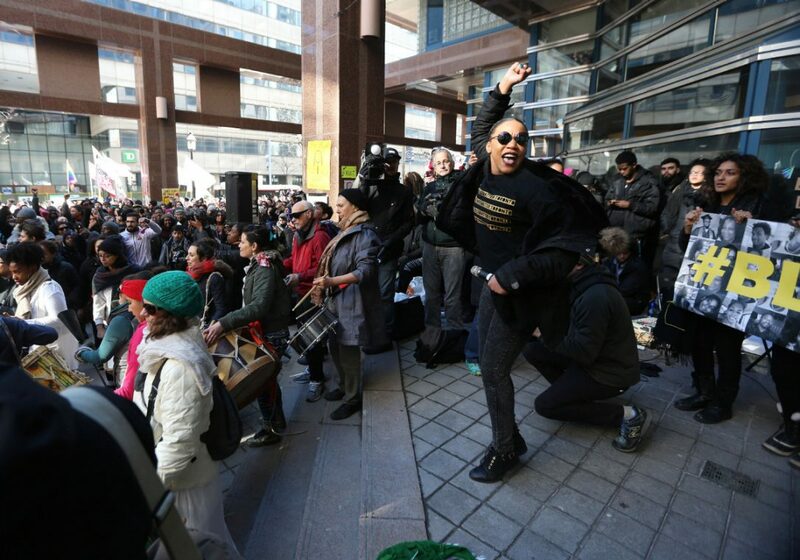 This international movement has been referred to as the “Black Spring.” The Muslim Students Association (MSA), another Muslim Brotherhood front, recently joined BLM in a Chicago protest to disrupt a Donald Trump campaign rally. But why is everyone jumping the ship of Christianity behooves me. While many will promote and argue the end of Christianity, these forget that Christianity predicted what they proclaim (2 Thess 2). Whatever they promote or try to destroy by revolution is exactly what is expected from the Judases of this world who in the end will only hang themselves. What's wrong with Jesus Christ? He called for equality between all races. He was neither left or right, and at times, He stood with the Samaritan over the Pharisee, and He even honored the Roman centurion over all the Jews. Unlike all western mutants and Muslim mutants, I chose Jesus Christ, while my family in Bethlehem scolded me for my change, calling me a “traitor.” I asked them, "Why did you, from Bethlehem, the birthplace of Jesus Christ, go all the way to the desert of Saudi Arabia to import a mutant named Muhammad?" I told them that I have questioned this choice and decided to honor Jesus, Who was born locally in our own village. It is all of you, not me, who are nothing more than a bunch of traitors. You betrayed Christ. They looked at me dumbfounded, like a deer caught in the headlight. But the deer, like the sheep, is dumb, his eyes are fixated on the headlights; he never learns, even after he is run over by the truck becoming a roadkill.